At the AIA 2015: A message of optimism! A week ago (May 14-16,2015) I participated in AIA 2015, the American Institute of Architects annual convention, in Atlanta. What an excellent event it was! The AIA 2015 was hosted at the state-of-the art Georgia World Congress Center, just a few blocks from downtown Atlanta. 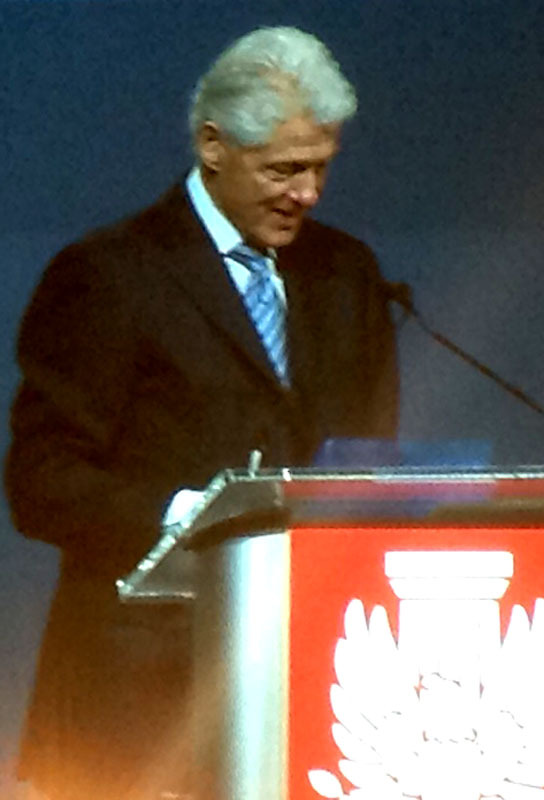 Anticipation and excitement mount as more than 7000 participants in AIA 2015 pack the main auditorium for the opening general session and keynote speaker Bill Clinton. Let me say this, for an event organized by a 158-year-old institution this one really energized me. I came back with a sense that this venerable and aging organization is full of pep with a message of optimism, and ready to do well not only by its members but for the communities where they practice, in the U.S.A. and the world. AIA 2015 VP and CEO Robert Ivy, FAIA reinforces the message of the AIA having a voice and making an impact! AIA 2015 Gold Medal winner Moshe Sadfie, remember ‘Habitat’ in EXPO 67 in Montreal? we heard words stated with forceful conviction about ‘doing things for a purpose’, ‘making and impact, and ‘having a voice’. I really believe that this institution that has done so well by its members, is now decidedly poised to take its rightful place in the national discourse and have its voice, the voice of its 86,000 members, heard and listened to with the objective of tackling critical challenges we face as a nation and as humankind, riding our spaceship Earth. From climate change, environmental degradation, energy, to sustainability and resilience, the AIA intends to make a significant contribution in the search for and implementation of effective solutions. This message of optimism was well-framed within the context of current world problems and future challenges, and the exciting opportunity these represent for the AIA, by an equally optimistic contribution by keynote speaker President Bill Clinton, during an opening general session attended by more than 7000 participants. This sense of optimism is reinforced not only by what I heard from the AIA leadership and the members, but perhaps even more so by what I heard from and saw on the faces of the rather large contingent of young, new generation, architects and design professionals participating in AIA 2015. During Q&A and in conversations with several of these young professionals after the conclusion of my seminar, I got the sense that they ‘get it’, they understand or know what the critical challenges are and they want an AIA that rises-up and confronts them effectively and with purpose. They do want an AIA with a voice that is not only heard nationally or worldwide, but that is sought by decision-makers here at home and elsewhere. The AIA must follow these words and expressions of intent with actions. These actions must be based on a clear statement of objectives, a well-defined strategy, and a simple and effective plan to execute initiatives on several fronts. I trust the institute will open itself to new fields of action, beyond its trusted education and outreach activities. An example of such critically needed new fields is applied research; what I mean by this is research in the pursuit of effective solutions toward the attainment of sustainable and resilient communities in regions that are highly vulnerable and fully developed, where we do not have the luxury of a clean slate to consider utopian design approaches, but where we must confront the reality of extensive urban development, a prevalent way of life and a standard of living, as well as critical environmental considerations to protect and take into account. While the AIA has no track record, to my knowledge, of engaging in or sponsoring this kind of research, I submit the time to engage in it is now as this will contribute a foundation of support to the objectives of ‘making and impact’ and of ‘having a voice’! AIA, I am ready to engage and do my part. Where and how do I sign up for it? Thank you for an excellent AIA 2015 Convention and for the new and inspiring sense of purpose you have offered your members and friends.